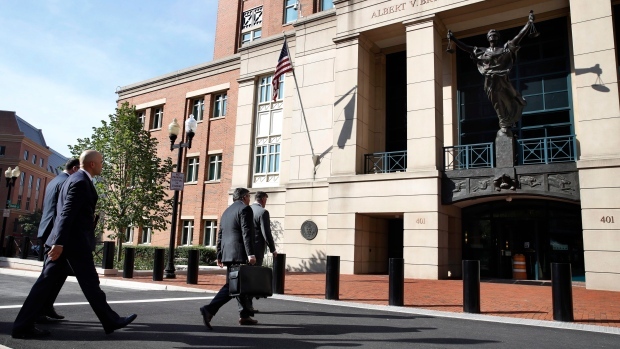 ALEXANDRIA, Va. -- A New York bank executive testified Friday that Paul Manafort received more than $16 million in loans after the bank's chairman expressed interest in joining Donald Trump's cabinet if he won the 2016 presidential election. The testimony in the former Trump campaign chairman's financial fraud trial came after proceedings were halted for hours by mysterious backstage discussions between the judge and attorneys for both sides. Prosecutors now say they will wrap up their case against Manafort on Monday. Defence lawyers have not said whether they expect to call any witnesses after that. The exchange came during a day in which jurors heard detailed testimony about Manafort's bank loans and about his New York Yankees luxury season ticket purchases -- paid for from an offshore account that prosecutors say he concealed from the IRS.